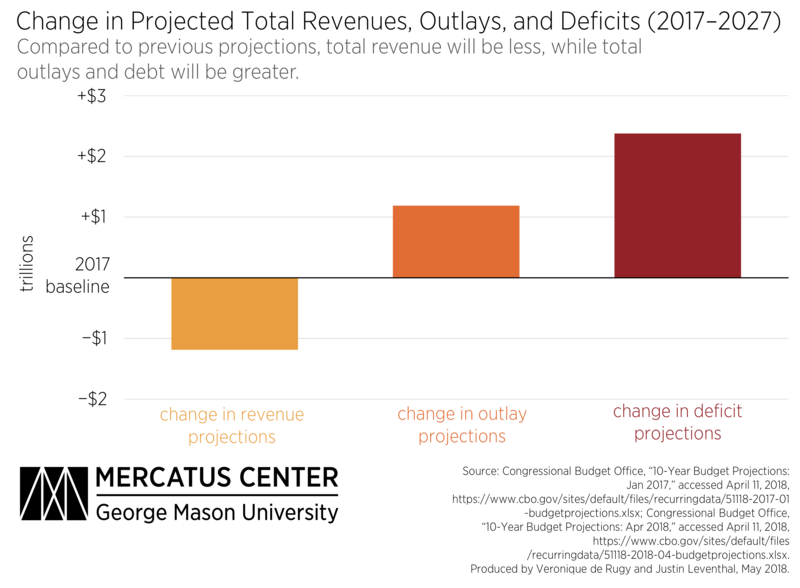 With recent changes to the US tax code, as well as shifting priorities when presidential administrations change, it is not surprising that the Congressional Budget Office (CBO) has updated its projections for federal revenue, spending, and deficits. 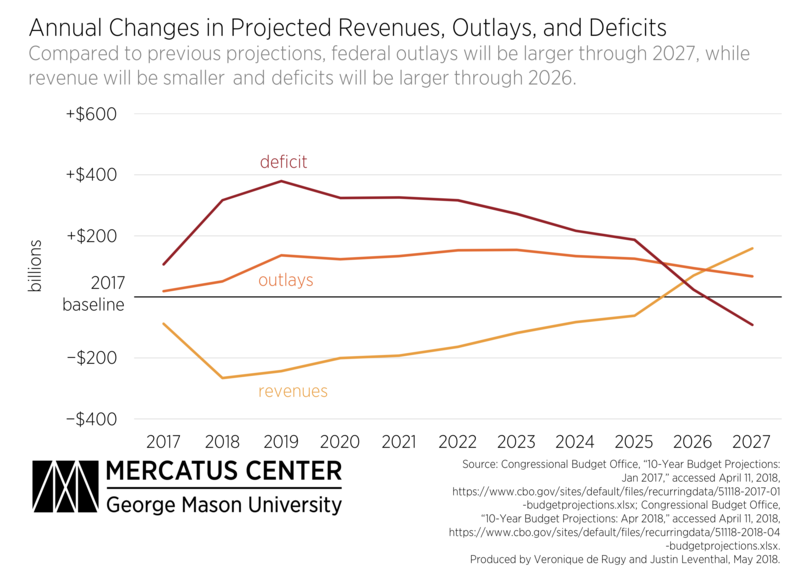 In April 2018 CBO predicted that revenues through 2025 will be lower than it predicted in January 2017; spending through 2025 (and for the foreseeable future) will be higher than predicted in 2017. The combined effect of these trends is that the federal deficit will be larger than predicted through 2026. Federal revenue over the next decade is now expected to be $1.2 trillion lower than previously predicted, while spending will rise by a similar amount. 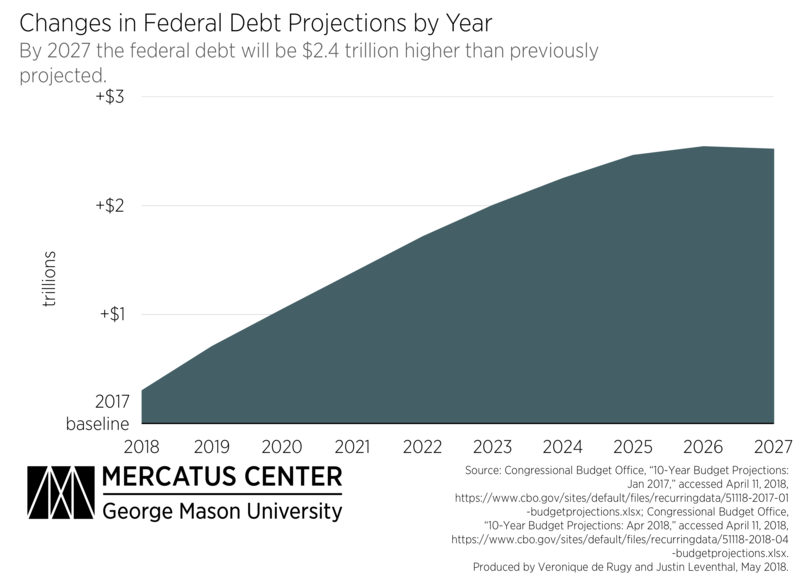 Combining the decreased revenue and increased spending puts America on track to be $2.4 trillion further in debt after the next decade than was projected one year ago. The bulk of the new debt is added in the first years of the decade with the prediction that immediate deficits will drive down future deficits. In this case, the federal deficit will supposedly return to previously predicted levels in 2027. However, projections that deficits will decrease multiple years down the road become more tenuous the longer the public is expected to wait. As time passes, the probability of economic changes—such as a downturn—become more likely, leaving the predicted early deficits highly likely and the predicted lower later deficits less likely.